D4 and D6 announced, with no-go lines. "As a bonus to our Botvac D3 and D5 Connected consumers, we will give you access to features like No-Go Lines and Quick Boost in a software update later this Fall." What about the botvac connected?! This was the top of the line! They've also scrubbed it off their products page. Re: WHAT THE HELL, NEATO! The new lineup seems pretty confusing. 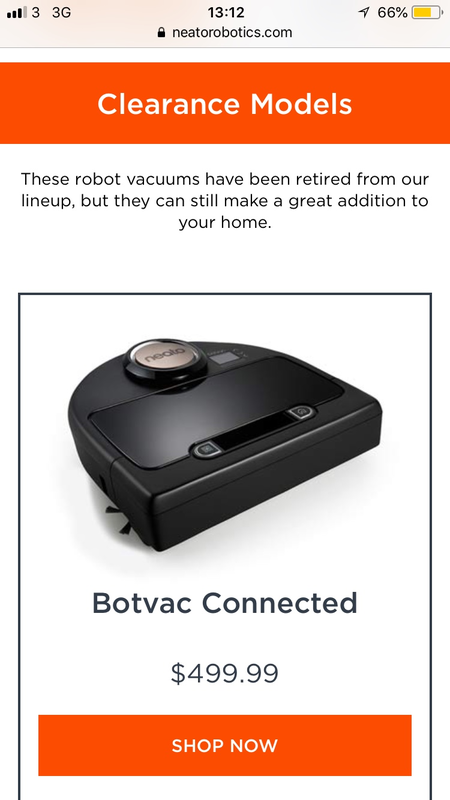 The original Botvac Connected is apparently a “retired” model now. Yes. I am disappointed too. When the D3 & D5 were released, the Botvac Connected was still sold as a premium model with the promise of “software update coming soon to bring these new features to you as well”. I wish I could be surprised. Neato’s engineering policy seems to be: “Move fast and break stuff”. I just wish they’d get around to including a new generation Lidar unit that didn’t fail so quickly. skyfox2k wrote: "As a bonus to our Botvac D3 and D5 Connected consumers, we will give you access to features like No-Go Lines and Quick Boost in a software update later this Fall." Does anyone have any insight into when this software update will be released? I bought a new D3 which is still in the box to replace a failed D80 but while I was waiting for it to arrive I saw a video that said kicking my D80 might get the 3000 error to clear. Low and behold I tried it and it worked, and it's been working for 3 weeks now. My window to return the D3 is closing in about 10 days, if they aren't going to release the new software soon and the D80 keeps working I'm inclined to send it back, but with the new No Go feature I might keep it, I have some tricky dining room chairs that the robots always seem to have trouble with and I hate having to use the mag tape in that area. Some users find it necessary to move dining room chairs for cleaning. They can be leaned against a wall raising the front legs to make room for robot vacuums. There is more to cleaning than just pushing the vacuum around... The C3PO class model is still unavailable. I just learned from this very thread that I own a "clearance model" now... I bought a Connected less than 6 months ago. I skipped on the D7 because I had no use for the no go lines, find me, 5Ghz wifi and multiple floor plans. I have zone cleaning and manual drive which D7 has but D6 doesn't. No go lines and find me would probably be software update only, but again as it has become a clearance model I'm not hoping to have any luck on that. Would be cool though. What a great idea. I'll have to try that. With six chairs set up in the dining area, I imagine I could save 10 minutes on a cleaning cycle by setting them up in close proximity. An old idea is leaning straight leg chairs against the wall with front legs raised for access. Does anyone knows something new about that update that's allegedly supposed to bring mapping and no-go lines to D3 and D5? Just got updated to 4.2.3-153 but the feature is not there. Darmach wrote: Does anyone knows something new about that update that's allegedly supposed to bring mapping and no-go lines to D3 and D5? Just got updated to 4.2.3-153 but the feature is not there. Minor bug fixes. It’s not the big update. Still no date for that yet. 4.2.3 When will that be available for Neato connected? So their Botvac Connected product page used to explicitly say that the ability to draw lines would be coming in an update? I bought this last Nov, still waiting on my update I know that much. False advertising? Unbelievable that Neato advertised that the Botvac Connected would be getting an update for no-go lines and then apparently decided not update the Botvac Connected. I bought mine in November of 2018 and it was way more expensive than the D3 or D5, both of which have since received the update. I'm thinking this should be a class action lawsuit!! !